Morgans are one of the American breeds. Descended from Justin Morgan, they have been noted as driving horses, working western horses, English park horses and most things in between. They are hardy, versatile, tough and spirited. 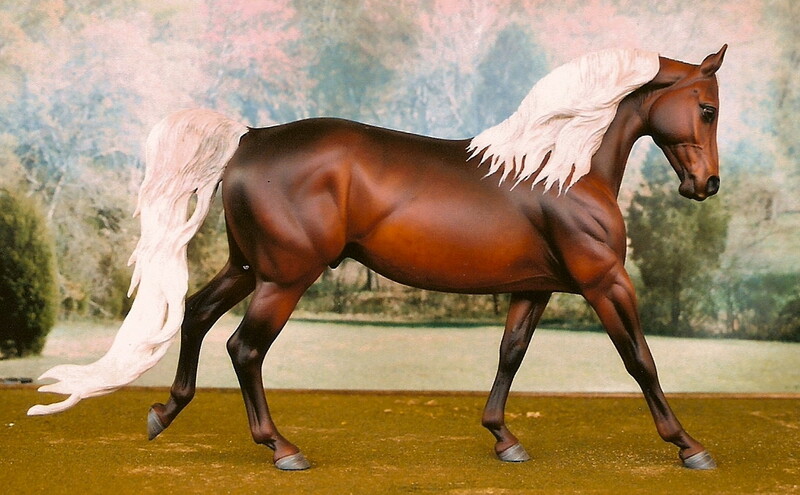 The Lippitt Morgans are considered to be the most pure, with all lines tracing back to original Morgan horses. 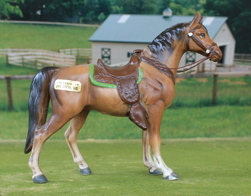 The Morgan horse contributed to the development of many other breeds, including Saddlebreds. 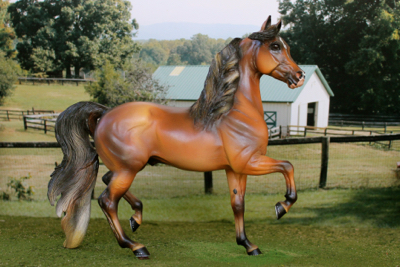 At some points, some of this Saddlebred blood was added back to some Morgans to increase their size and high action. Even so, all lines are registerable Morgans, and quite distinct from any other breed. 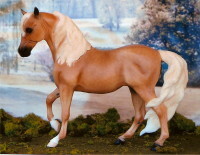 Morgans occur in many colors, although chestnut, bay and black are the most common, and the Lippitt horses are almost always these colors, with no or few white markings. Other lines can be palomino or buckskin. Grey and dun are both very uncommon, but exist in certain lines. Sabino can occur in some lines. Once, a frame overo horse was registered Morgan. When he produced pinto foals, his registration was cancelled, as were those of his pinto offspring. However, some of his minimally marked progeny were allowed to remain registered, and with the white rule lifted, more and more extensive white markings are being seen. Morgans are very frequently named using the breeder's farm name as a prefix. I strongly prefer you to use "Laurelwood" as a prefix for any offspring from my mares. I may refuse requests which do not. Names may contain 25 letters, spaces or punctuation marks or fewer. ->Mayflower Hawk 1960-1990 chestnut (O C R [l] x Tippy Dee [l]- Hawk Jim) Good old lines close-up: OCR by Captor by Mansfield. Linebred to Ulysses, Bennington, Lady Sealect. H-R Lippett OF. Sire of Amanda May and Laurelwood Mayflower Pilgrim; grandsire of Wolf River Obsession and Laurelwood Fleur-de-Lis. ->Applevale Applause 1972-2006 Bay (Applevale Encore [m-km] x Applevale Katonah [m-km]-Pecos [l]) Pecos top and bottom, Upwey Ben Don, Mentor, Ulysses. 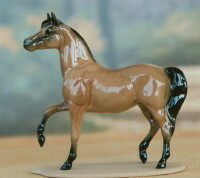 Breyer SM #5035 OF touch-up '75. Retired MULTIPLE CHAMPION. Sire of Laurelwood Esteem, Laurewood Ovation, Laurelwood Acclaim, Laurelwood Debutante. (Mayflower Hawk [m-lod] x Sonnett's Last Song [l]) Sire traces to O C R, Ulysses, Bennington, Lady Sealect; dam has a nice pedigree, with Chasley Superman on the sire line, and Cathy Serenity on the maternal sire side. Old lines. (RA Magic Man [m-h.gnidovec] x RA Rosebud [m-h.gnidovec]- Silver Breeze [bso-w.blum]) UVM lines, Senatefield, Warhawk, Townshend Gaymeade, Mr. Breezy Cobra, Prince de Jarnette, Saracen, Orcland Leader, Mansfield. Grey line through Frosty's Bluebonnet. Sire of Icy Reception, o/b Sherry Ball. (Applevale Applause [m-lod] x Brooksong Three Wishes [m-rds]-Pecos Black Fox) Persimmon Hill sire has Applevale lines to Pecos, Upwey Ben Don, and Ulysses, out of a mare with additional Applevale breeding, plus Tutor and Delmont. IPABRA 2001 Nationals Top Ten. 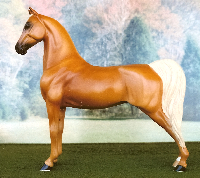 IPABRA Top Ten Year-End OF Morgans in 2001, MEPSA 2002 Year-End Championship Top Ten Morgan and also Breyer SM/LB (in a class of 139 winners!). (Riverview Mocha Echo [m-bb] x Triton Foxy Joyce [l]- Applevale Red Fox) Trophy, Upwey Ben Don, Hawk Jim, Senator Graham, Stetson, Sonfield. 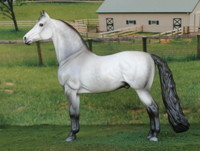 (Treble's Willy Wild [®] x Celtic Dancer [®]- Big Oak Black Tie) Sire is bay or brown. Lines to Waseeka's Nocturne, Upwey Ben Don, Lippitt Ashmore, Ulendon, Mansfield on both sides. Also Cornwallis and Quietude. Sire of Foxfire Khryssa, o/b Delana Metcalf. Foals: 1993-2011. Will be off list next update. (Twilight Music [m-av] x Riverview Sunstar [m-bb]-Applevale Sunstar) Sire line to Waseeka's Nocturne. Also Ulendon, Pecos 2x, Lippitt Rob Roy. More Pecos in damline, Whitmorr Limelight, Canfield, Sonfield. Sire of Canadian Pride's Jubilee Premier, o/b Crissi Nickerson. (SLM Color Of Right [m-slm] x Laurelwood Fahlene [m-lod]- Waseeka's In Command [l]) Grandson of Upwey Ben Don. Lines to Moro Hills Mequon, Lord Appleton, Ulendon, Pecos. Sire of Royal Crest Araina, 00, o/b Ryder Kain and Laurelwood Diplomat, 97, o/b Kay Myers. (Black River Pegasus [m-ff] x Fair Hill Baby Doll [l]- UVM Viking) Sire a Live show Champion, & an approved portrait model. He has lines to Captor, Delmont, Congo, Jubilee King, UVM Flash and Green Mt horses. Sire of Spellbound Secret, o/b M. Addison. (Foxfire Star Voyager REM [m-d.metcalf] x Foxfire Star Whispers [m-d.metcalf]- Whispering High Beam®) All lines to live, with 2x Beamington, Donlyn of Windcrest, Senator Barr, UVM Astronaut, Mr Breezy Cobra. Grey line through Frosty's Bluebonnet. 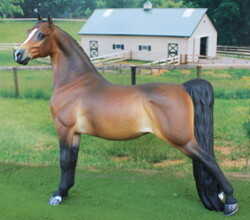 Breyer OM wild dapple Morgan OF. Sire of The Quiet Man, o/b M.Addision and Evenmist Odyssey, o/b Randa Garrett. (Royalton Perfection [m-rvf] x Good News Priscilla [l]-Mededith Smoky) Full Lippitt blood. Sire of Laurelwood Ashen Joy, LSP, bred by Randa Garrett. (Gold Cross Sundance® x Laurelwood Sunbonnet [m-phf]- WA Sunfield [m-a.strohm]) Working western lines.Californio, Whippoorwill Duke, Vigilmarch, Sonfield, Sparfield, Rockfield, Dyberry Ethan. Sire of Laurelwood Montana Goldrush, 02, o/b Nora Colina; Laurelwood Golden Eagle, o/b Caroline Spracklin and Laurelwood Marchhawk, o/b Malinda Welte. (Troubador [m-j.hoppenrath] x Laurelwood Ladyhawk [m-phf]- Sunup Neptune®) Bred by Alison Strohm and Jeni Hoppenrath. Lines to King Richard®, Cute®, Chief Justin Morgan®, Painted Girl® chestnut frame/sabino, Kingston®, Ulendon®, Orcland Youlenda® 1955 black silver, on top and Lippitt & working western on bottom, with Sparfield, Rockfield, Moro Hills Manito, Dyberry Ethan and Lippitt Rita Roy. Sire of Laurelwood Impulse, o/b Caroline Spracklin. (Robbi Sues Sweet Success [live] x Amanda May [m-phf]- Mayflower Hawk) Rarest coloration in the Morgan breed. Sire is over half Lippitt, with other lines to Brown Pepper, Juzan, Flyhawk. Dam is old government and Upwey Ben Don, Waseeka's Nocturne breeding. Beside his gorgeous color, he has the balanced conformation and attitude for about anything. Moody 'Magnificence' resin, finished by Laurie Jo Jenson. LIVE SHOW WINNER, MEPSA Reserve Champion, MEPSA Championship Top Ten 2001. Sire of Intensive Game Plan, o/b M. Addison, MMR Golden Obsession; Laurelwood Velvet, o/b Nora Gunderman and Laurelwood Fascination, his herd replacement, o/b PHF. Spirit of Seventy Six [m-phf] x Ashmoro Bonnie Mint [m-phf]- Robert LeBrun[m-bb]) Full Lippitt. Dyberry Ethan, Lippitt Ethan Ash, Lippitt Moro, Allen's Major, Lippitt Georgiana, Ryegate Moro Magic, Highpastures Ivanhoe, Royalton Ashline, Moro Hill's Adonis. Sire of Laurelwood Blythe Spirit, 06, o/b PHF. (Delphi Adonis [m-phf] x Whippoorwill Halo®- Sereno Dandy Vermont) See reference stallions for sire info. Sire's sire is a model Champion from Jen Raymond's stable, with Champion model parents. From there, all lines are live, Eco Jubilo, Tutor, Clement, Montabell. Sire's dam is by Californio, with additional lines to Jubilee King through Squire Burger and more Mansfield. Dam brings in lines to Whippoorwill Duke, Red Correll, Merry Knox, Vigilmarch and one more line to Eco Jubilo..
(Riverview Night Wind [m-m.schoedel] x Mountain Silver Sunshine [m-m.schoedel]- Mountain Silver Smoke [m-a.geci]) Beamington, Flyhawk, Whippoorwill Duke, Funquest Juzette, Chingadero, Frosty's Bluebonnet. 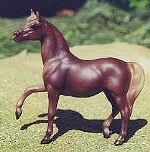 HR rerelease mini Morgan stallion. (CWS Silver Ash® x Successful Outta The Blue®- Robbi-Sues Sweet Success) Sire carries the grey gene from his dam, Hy Crest Satina. Dam carries dun from Pendleton Buck Missy. Lines to Ashwood Jess Pride, Dyberry Ethan, Lippitt Moro Alert, Wind-Crest Donfield, Hy Crest Koko, Royalton Ashton Darling, Robbi Sue Moralert, Zipo, Suncrest Boy. (Laurelwood Obsession [m-phf] x Ashmoro Bonnie Mint [m-phf]- Robert LeBrun [m-a.fraley]) Sire is over half Lippitt, and dam is full Lippitt. Lines to Royalton Ashbrook Darling, Ryegate Moro Magic, Highpastures Ivanhoe, Royalton Ashline, Moro Hill's Adonis, Brown Pepper, Juzan, Flyhawk, Upwey Ben Don, Waseeka's Nocturne. Replacement for his sire in our herd. Moody AR 'Magnificence' by Laurie Jensen. ESR Into The West [m-m.addison] x Belle's Magic Star [m-m.addison]- Annaray Magic Justice®) full Lippitt breeding. All lines to live. Lines to Jake Mint, Lippitt Bruce, Meredith Bilirubin. Winner, IPABRA Reserve Champion (of 120 stallions). (Century Free Spirit [®] x Tedwin Tango [®]- Tedwin Topic) Full sister to World Champion 3yo Futurity Park Harness Liberation Rhythm N Blues. Century Free Spirit is 1988 World Champion Stallion. Son of Park and Halter Champion Wham Bam Command. Dam, Tedwin Tango, was World Park Champion and noted as a fine broodmare. Twice each to Waseekas Nocturne, Trophy and Upwey Ben Don. Bred to produce. (Robert LeBrun [m-bb] x Adele Ratignolle [m-bb]) Full Lippitt. Ryegate Moro Magic, Highpastures Ivanhoe, Royalton Ashline, Moro Hill's Adonis. May be bred only to full Lippitt sires except with permission. Dam of Laurelwood Spearmint Spirit, her replacment in our herd, 93, o/b PHF; Galileo, 95, o/b Chris Wallbruch; Laurelwood Indigo Spirit, 98, o/b PHF; Laurelwood Chamomile, 05, o/b PHF; and Laurelwood Fascination, 07, replacement sire for Laurelwood Obsession, o/b PHF. (Turfwood Royal Flush [l] x Fleur de Jarnette [bso-lod]-Whippoorwill Duke [l]) 4 gen.ped. Brunk and Lippitt lines. Jubilee King through Jubilee's Courage, Juzan and King de Jarnette; Mansfield and Sentola. Creme gene carrier through her bottom line. Dam of Gala Apollo, 91, on this list; Golden Spirits, 93, o/b Mary Vinyard; Cartier Classic, 94, o/b PHF; Darwin's Dream, 99, o/b Melissa Addison; LWD BW Gold Meadow Adonis, 00, o/b Jean Radde and Icy Reception, 03, o/b Sherry Ball. (Tom Sawyer [m-wwmh] x Closer To The Heart [m-wwmh]- Windcrest Supreme) Lines to Lippitt Ethan Ash, Waseeka's Nocturne, Upwey Ben Don, but none of these until the 4th generation. Sire is a show winner and Reserve Champion; dam is show placed and a good producer! Dam of Pumpkin Glow, 96, o/b Karen Fawcett and Laurelwood Diplomat, 97, o/b Kay Myers. (WR Sunfield [m-wolfriver] x WR Caprice [m-wolfriver]- Moro Hills Manito®) Lines to Sparfield, Sonfield, Rockfield, Moro Hill's Major, Dyberry Ethan, and Lippitt Rob Roy. Working western and Foundation Morgan/Lippitt lines. Hagen Renaker scratching mare, separated from companion. Dam of Laurelwood Goldhawk, 93, o/b PHF; Laurelwood Sonata, 04, o/b Mary Schoedel and Laurelwood Apollo, HR mini Morgan foal, 09, o/b PHF. (Sunup Neptune® x Lenawee Charity®- Hylees Flame Fire) Sire is sire of NVS Midas, 2005 5th place Grand National Open Reining. GR Nat'l CH, Regional Champion in Trail and Reining. Flyhawk bred. Working western lines. Dam of Multiple Champion Laurelwood Balladier, 96, o/b PHF and Belgian halfbred sporthorse, Odin, 98, o/b PHF. (Shagwood Shininghero[l] x Kennebec Cameo [bso-lod]- Californio[l]) 4 gen ped. Lippitt Sam Twilight, Flyhawk, twice to Californio, once in the 2nd gen. once in the third. Working western, Lippitt and government lines. Dam of Aster, 97, o/b Alethea Drexler; Laurelwood Aurifex, 98, o/b PHF; Laurelwood Golden Eden, 00, o/b Julie Harris and Laurelwood Shining Scholar, 01, o/b PHF. (Laurelwood Wintergreen [m-phf] x Wolf River Idyll [m-phf]- Wintertime [m-a.strohm]) This mare is the lookalike herd replacement for her National Champion dam. Lines to Waseeka's Nocturne, Orcland Vigidon, Trophy, Mor-Ayr Supremem, Rosevelt, Lippitt Moro Ash. (Delphi Adonis [m-phf] x Laurelwood Gala Champagne [m-phf]- Turfwood Royal Flush®) Sire's sire is a model Champion from Jen Raymond's stable, with Champion model parents. From there, all lines are live, Eco Jubilo, Tutor, Clement, Montabell. Sire's dam is by Californio, with additional lines to Jubilee King through Squire Burger and more Mansfield. Dam has lines to Jubilee King through Lamont, Clement, Juzan, plus Lippitt Rob Roy. Lakeshore Miz Charisma OF SR.
(Rum Brook Immortal Image® x DKs Spring Topic® -Tedwin Topic) Sire is a typey Morgan by leading sire Immortal Command. Lines to Waseeka's In Command, UVM Flash, UVM Trophy, Red Pepper, Waseeka's Nocturne, Chasley Superman. Dam of Banner Of Laurelwood, 03, o/b PHF and Laurelwood Miss Vermont, 10, o/b PHF. (Riverview Zodiac [m-c.hartung] x DHR Galizia [bso-c.hartung]- Sirius) all live Morgan lines. See this site for information about frame Morgans- http://www.morgancolors.com/ Also, read about War Paint- http://www.rainbowmorganhorseassoc.com/index/articles.html Galizia comes from a line of gaited Morgans and is gaited herself. BSO at this time. Dam of Laurelwood Brindabella, 04, o/b PHF. (Mt Hope Sharp Pepper® x Autumn In Vermont [m-phf]- Applevale Voyager®) Sire is by Cajun Pepper, a lovely solid chestnut Champion in hand, under Park saddle, and in Harness. Sire's dam is by Applevale Storm King. Lines to Pecos, Upwey Ben Don, Bennington, Cornwalis, Mansfield, Jubilee King, Flyhawk and Orcland Leader. HR mini "Liberty Belle" Morgan mare. (Covenant Nathan Ash [®] x Blue Valley Mariah [®]- Stillwater Indigo) Full Lippitt. Sire is a champion in In Hand, Carriage Driving, Versatility, Saddle Seat Pleasure, Dressage and Combined Driving;has won Pleasure Driving and Jumping classes, as well as placing seventh of 13 in his one Combined Training event, winning the Cross-Country section. He is also sire of Champions. Dam of Laurelwood Conquistador, 02, o/b Vicki Griffiths; Laurelwood Magic, 04, o/b Mary Schoedel and Laurelwood Velvet, 09, o/b Nora Gunderman. (Higuera Bandido® x Castle Monterey®- Wests Bay King) Working western ranch horses with mostly old foundation and some Government lines. Senator Graham, Flyhawk, Flying Jubilee, Sonfield, Duke, Go Hawk, Hedlite. Dam of Laurelwood Jamocha Bay, 04, o/b PHF. (Autumn Ember [m-phf] x Laurelwood Fahlene [m-phf]- Shagwood Shinghero [®]) Sire by UVM Lash®, has lines to Upwey Ben Don, Pecos, Orcland Vigildon, Bennington, Jubilee King, Orcland Leader. Dam has Waseeka lines, by Waseeka's In Command. Waseeka's Nocturne, Upwey King Ben and Pecos lines. Linebred AMAHA Hall Of Fame Upwey Ben Don. (Randallane Genesis [l] x Laurelwood Marchioness [m-phf]-HVK Fieldmarch®) Sire is a very typy full Lippitt, shown in hand, under western, park and hunt seat saddle. Dam is a MIJC Supreme Champion. Also lines to Canfield, Tutor, Vigilmarch, Jubille King, and the great broodmare Cathy Serenity (dam of 3 Grand National Champions), herself about 3/4 Lippitt. (Moonlight Wham Bam [m-j.sorensen] x Golden Cobress [bso-j.sorensen]- Primavera Valdez®) By a WC In Hand and Park Saddle Champion Tug Hill Whamunition® son. Mansfield, Bennington, Upwey Ben Don, Waseeka's Nocturne, Mr Breezy Cobra. Mostly Government lines, and some Brunk. These are showhorse, high action lines, but the Brunk lines went into the development of the Working Western horses. 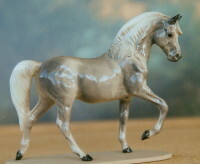 HR rerelease mini Morgan mare OF. Dam of Laurelwood Roulette, 08, o/b PHF. High quality offspring only- OF, AR or CM. (Syringas Knightyme Magic® x Higuera Monterey Bay [m-phf]- Higuera Bandida®) Working western lines, with Senator Graham, Flyhawk, Flying Jubilee, Sonfield, Flyhawk, Stellar, and the Funquest horses, Funquest Talstar and Funquest Pat Hand. 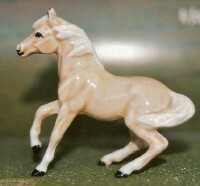 Artline Japan saddled western horse OF. (Devine Spirit Of Hope® x Devine Catalina®- Sandrock Joel) Full sister to a lovely live mare, Devine Mountain Echo. This mare has a lovely coat color. Lines to Blacksaddle Starbuck, Sunup Neptune, Sandrock Joel, Moro Hills Bandit, O C R, Marvelous Mariner. (True North® x Bradfords Countess Echo®- Springhills K C L) Lines to Entertainer, Beamington, Kennebec Count, Windcrest Splendor. 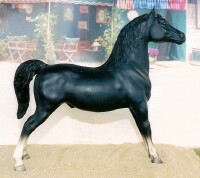 Sire is a lovely homozygous black stallion. See him at www.rafterbardmorgans.com. Outstanding performance lines with many In-Hand wins as well. 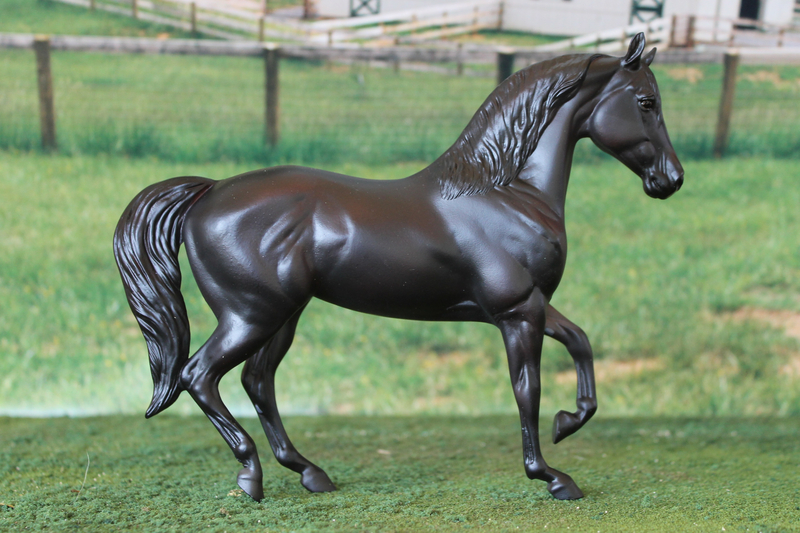 Breyer classic "Morab" Raven and foal OF 2014.